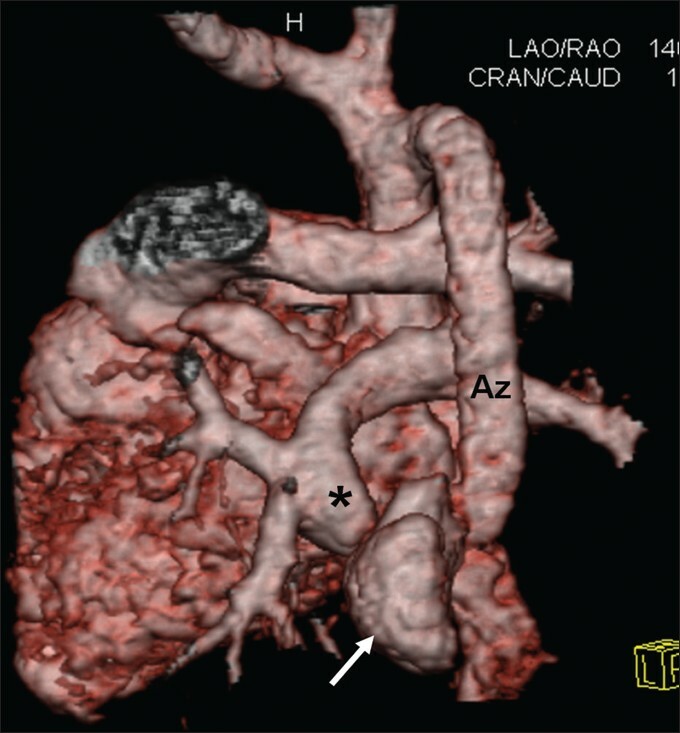 Total anomalous pulmonary venous connection (TAPVC) is an admixture lesion wherein whole of pulmonary venous return mixes with systemic venous return before getting into aorta. The site of anomalous connection to the systemic venous system varies and forms the basis of classification into supracardiac, cardiac and infracardiac variants. The presence or absence of obstruction in the circuit including at the site of atrial septal defect (ASD) further impacts the clinical presentation and outcome. The likelihood of obstruction varies with the site of drainage and forms the basis of timing of surgical correction. The importance of complete delineation of drainage path for surgical correction cannot be overemphasized. We hereby present a case of a neonate with clinical presentation consistent with obstructed TAPVC and an obstructed descending vertical vein. However, contrary to the expectation the drainage was into azygos vein, an uncommon site of drainage which is almost always obstructed. An 8-day-old male neonate presented to us with rapid breathing and cyanosis. Tachypnea, tachycardia, cyanosis and heart failure were evident on examination. Chest radiograph showed a normal-sized heart with severe pulmonary venous hypertension. Clinical picture was suggestive of an obstructed TAPVC. A trans-thoracic echocardiogram confirmed absent pulmonary venous connections to left atrium, a non-restrictive ASD flowing right to left and severe pulmonary arterial hypertension (predicted right ventricular systolic pressure = 76 + right atrial mean). All four pulmonary veins joined to form a common chamber that drained inferiorly through a vertical vein showing low-velocity downward flow. Surprisingly, this vertical vein could not be imaged crossing the diaphragm and, instead, the superior vena cava (SVC) was found to be dilated. Turbulent flow (continuous gradient of 18 mmHg) could be visualized further downstream, but the exact site of obstruction was not clear on echocardiography. A subsequent computed tomography (CT) angiogram (CTA) confirmed the presence of a descending common chamber, lying to the left of the spine. This chamber formed a vertical vein that traversed across the spine to join the azygos vein just above the diaphragm [Figure 1] and [Figure 2]. The dilated azygos vein drained into the SVC at its usual position. There were two sites of severe stenoses, one within the vertical segment and other at the site of entry into azygos vein. Findings were confirmed at surgical repair, wherein the common chamber was opened into the left atrium and the vertical vein was ligated. The child had an uneventful post-operative course. Differentiating azygos vein drainage of the pulmonary veins from a direct drainage into SVC is important because of a potential risk of injury to right pulmonary artery (RPA) and/or right bronchus during surgical repair of the latter. When the vertical vein joins the SVC directly, it opens into the lower part of SVC, coursing anterior to the RPA. In contrast, when drainage is through the azygos vein, it runs posterior and superior to the RPA, joining the SVC at a higher level. These details are not seen easily on echocardiography, and this is where a CTA is immensely useful. The main advantages of multi-slice CTA in congenital cardiac anomalies like TAPVC are the relative ease and accuracy with which the diagnosis can be made, as also the speed with which the procedure can be carried out. Unlike transesophageal and angiocardiographic images, which are difficult to provide three-dimensional orientation, the 3D rendering and the multiplanar images give a clear three-dimensional picture to the surgeon of what one is likely to find on the operating table. Our case highlights the importance of delineating the complete anatomy of the pulmonary venous circuit in patients of TAPVC. Involvement of the azygos vein in the course should prompt a CTA unless the complete course is easily defined by echocardiography. 1. Neill CA. Development of the pulmonary veins with reference to the embryology of anomalies of pulmonary venous return. Pediatrics 1956;18:880-7. 2. Delisle G, Ando M, Calder AL, Zuberbuhler JR, Rochenmacher S, Alday LE, et al. Total anomalous pulmonary venous connection: Report of 93 autopsied cases with emphasis on diagnostic and surgical considerations. Am Heart J 1976;91:99-122. 3. Edwards JE. Pathologic and developmental considerations in anomalous pulmonary venous connection. Proc Staff Meet Mayo Clin 1953;28:441-52. 4. Musolino AM, Santora G, Marino B, Formigari R, Guccione P, Pasquini L. Echocardiographic diagnosis of totally anomalous pulmonary venous connection to the azygos vein. Cardiol Young 1999;9:305-9. 5. Moes CA, Fowler RS, Trusler GA. Total anomalous pulmonary venous drainage into the azygos vein. Am J Roentgenol Radium Ther Nucl Med 1966;98:378-87. 6. van Son JA, Hambsch J, Kinzel P, Haas GS, Mohr FW. Urgency of operation in infracardiac total anomalous pulmonary venous connection. Ann Thorac Surg 2000;70:128-30.